Fifty-nine formerly homeless seniors have a permanent place to live thanks to Talmadge Gateway, Wakeland's new community in the historic mid-city San Diego neighborhood of Talmadge. 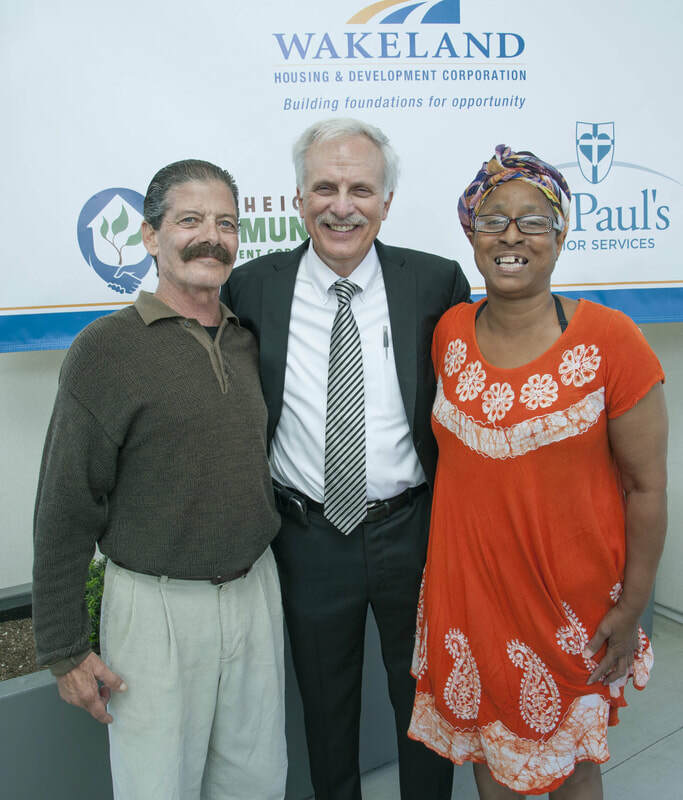 City and state officials, project partners and residents gathered in late July to celebrate the grand opening of the new permanent supportive housing community, which was developed in partnership with City Heights Community Development Corporation with wrap-around resident support services provided by St. Paul's Program of All-Inclusive Care for the Elderly (PACE). The seniors who live at Talmadge Gateway include Malvina Landry, a former nurse whose health problems led her to become homeless. Upon seeing her new, furnished apartment at Talmadge Gateway for the first time, she was overwhelmed, saying, "It's perfect!" You can learn more about Malvina in this story from KGTV. Wakeland President and CEO Ken Sauder recently accepted an invitation to join the Board of Governors of the San Diego Regional Task Force on the Homeless (RTFH), the organization leading the charge to end homelessness in the San Diego area. Sauder will lend his expertise from nearly three decades spent developing and financing affordable housing toward finding solutions for the current homeless crisis. "As our regional Board works together to reduce homelessness in San Diego, we need members who are well-versed in proven ways to provide the housing necessary to address this complex issue," said County Supervisor Ron Roberts, who also serves as chairman of the RTFH. "Ken Sauder has a deep understanding of what it takes to create permanent supportive housing and I welcome his insights as a developer of these types of projects." Wakeland extends thanks to the Union Bank Foundation for awarding our organization a generous three-year, $75,000 grant through its Expanding Housing Opportunities Program (EHOP). The funds will help Wakeland staff move forward on five projects that will create new and preserve existing affordable and permanent supportive housing - including The Beacon Apartments, which will provide 44 new homes with support services to people who have been homeless, helping to alleviate the City of San Diego's growing need for permanent supportive housing. Our City San Diego has named Wakeland's Atmosphere community San Diego's Best Affordable Housing in its September/October issue. "The project's value comes from its attention to bringing diverse and affordable housing options to a major downtown area," contest judges said of the 205-unit downtown San Diego high-rise, which combines affordable housing with permanent supportive housing designed to stabilize people who have been homeless. Meanwhile, on October 13, our Home Front at Camp Anza community in Riverside, California, will be presented with the California Preservation Foundation's Preservation Design Award. The honor is given to historic preservation projects that have achieved the highest level of craftsmanship. The Home Front at Camp Anza project included the rehabilitation of a 15,000-sq. ft. WWII-era Army Officers Club for its new use as a community center for residents at 30 new construction affordable homes designed for veterans and their families. Finally, congratulations to Wakeland CEO Ken Sauder for being named one of San Diego's 50 Most Influential Business Leaders by the San Diego Daily Transcript in the publication's annual ranking.